A calm and misty morning resulted in a small arrival of migrants in the bushes and a decent passage overhead. The best of the grounded migrants were a Woodlark, three Firecrests and a few Goldcrests, 40 Chiffchaffs, ten Song Thrushes and 16 Redwings whilst birds passing overhead included 300 Swallows, 800 House Martins, six Grey Wagtails, seven Bramblings, 105 Redpolls, a Crossbill, 275 Goldfinch, 93 Siskins and 14 Reed Buntings. The sea was very quiet except for a trickle of Brent Geese passing by and five Mediterranean Gulls. 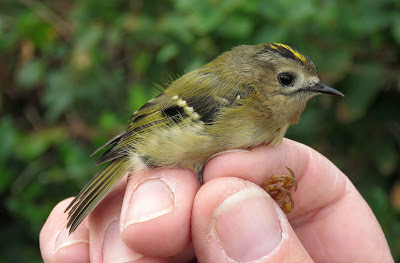 One of the most surprising things of the day was the catching of a retrap Goldcrest. Nothing remarkable in itself except that this bird was actually ringed here as a migrant on 16th October 2015. It is extremely rare to retrap passage migrants in subsequent years.